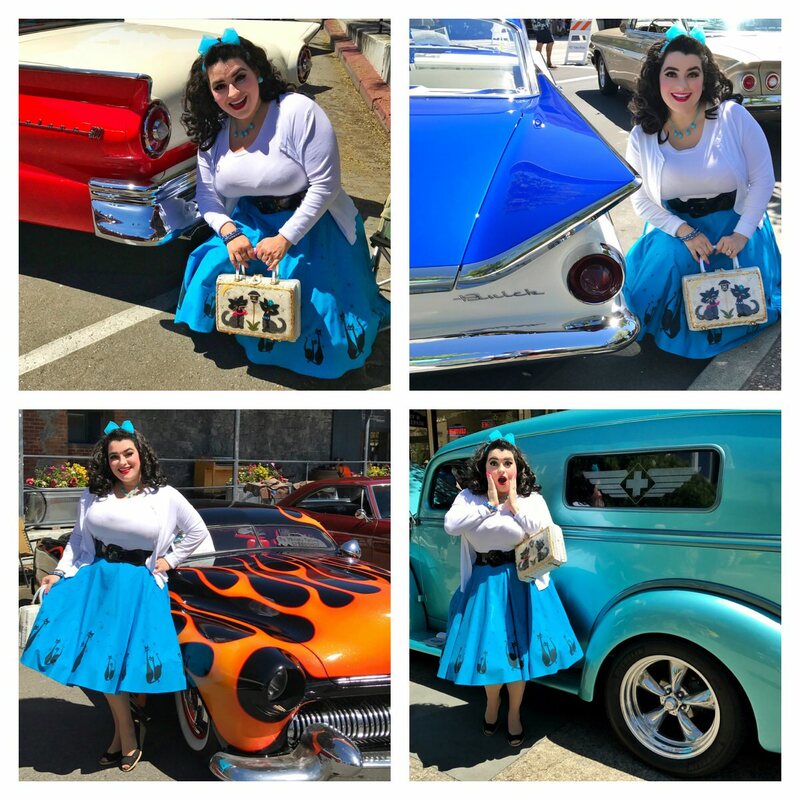 It was our first time attending the Salute to American Graffiti classic car show in Petaluma. It was the 12th year for the event. The event is put on by volunteers that raise funds for local community projects while paying homage to the 1973 movie American Graffiti by Francis Ford Coppola, George Lucas and a cast we all know today featuring Ron Howard, Harrison Ford, Richard Dreyfuss, Suzanne Summers, Cindy Williams, Wolfman Jack, and more! Petaluma is where most of the movie was filmed. The car show spans several downtown Petaluma city blocks and there are so many classic cars. We saw fabulous Ford Fairlanes, Impalas, Chevy Bel Airs, Deuce Coupes, Trucks, Corvettes, Mercury’s, Corvairs, HotRods, Mustangs, Buicks and so much more. These cars were stunning!! All the car owners were so friendly and were happy to talk to you about their cars and all the work that went into restoring them. Highlight for me was coming around the corner to a more closed off area where the actual cars from the movie were!! Here I am next to the white T-Bird that Suzanne Summers drove!! 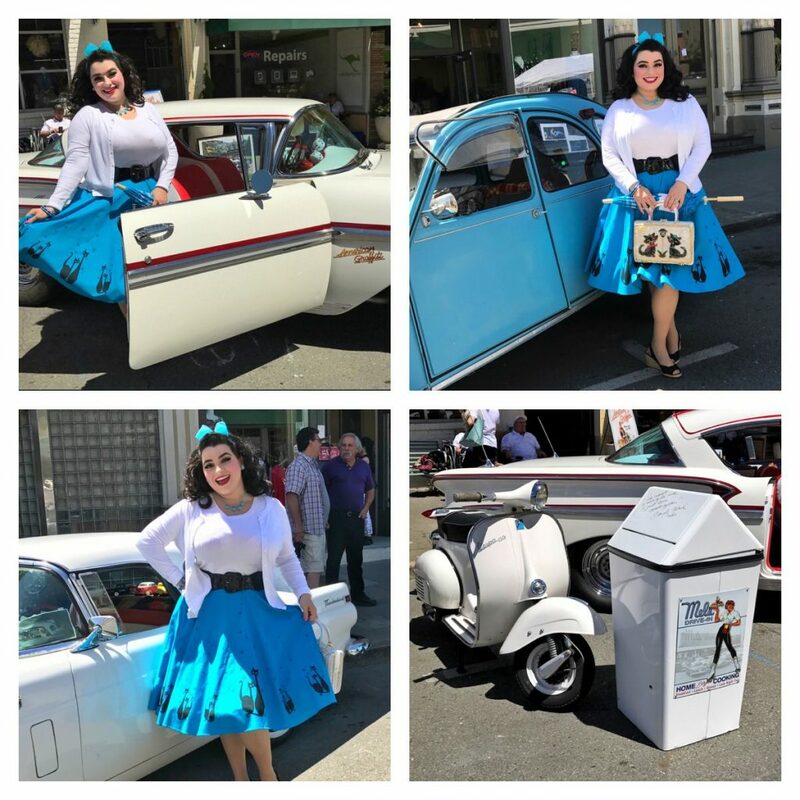 Also, a pic of the blue Citroen 2CV that Richard Dreyfuss was in, the 1958 Chevy Impala driven by Ron Howard and the Vespa that Charles Martin Smith, and the cute trash can from Megs Drive-In. My outfit was specific for the event as it was a tribute to the American Graffiti movie. 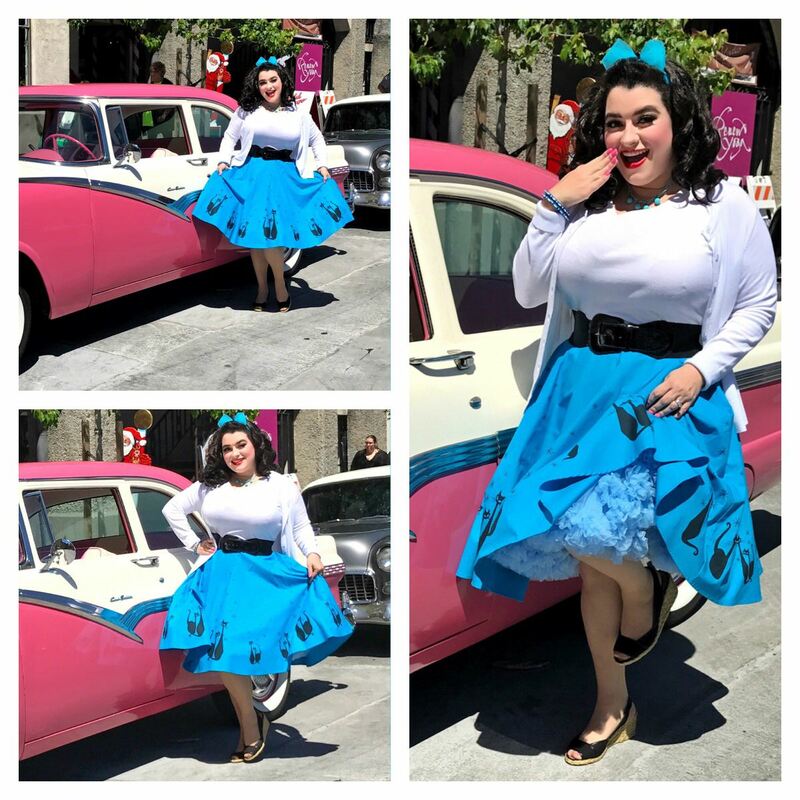 I wore my favorite Heart of Haute circle skirt with design from El Gato Gomez and a simple white twinset, as I wanted the skirt to be the main foal point. I even had my true vintage kitty cat wicker purse and tied a blue hair scarf on. The day was very hot…. In the 90s!! Attendees at the car show were so nice and friendly. We took so many pictures and this post has some to give you all an idea of the beautiful cars. It was a really fun classic car show. I can’t wait for next year! !